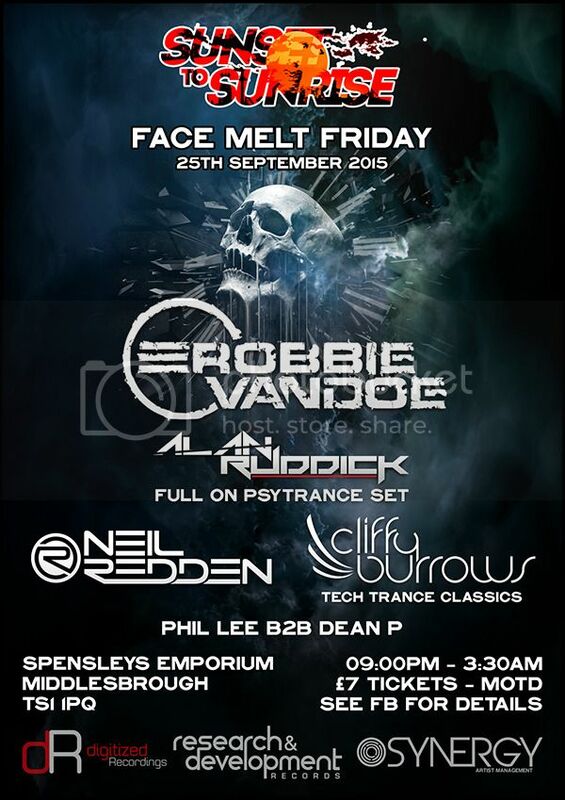 Next up for Sunset To Sunrise is Face Melt Friday and what a line up we have for you. Headlining his debut at S2S is the awesome Robbie Van Doe, with releases on Mental Asylum, Discover Dark and other labels, this guy is guaranteed to smash the place! Backing him up will be a massive full on Psy set from Alan Ruddick, and a one off return to the decks for Cliffy Burrows, Cliffy will be playing a set of Tech Trance Classics. Plus they will be support from residents Neil Redden, Phil Lee and Dean P. Viva la S2S!!! For anyone wishing to travel to the event Middlesbrough Bus Station is 5 mins walk from the venue, Middlesbrough Train Station is across the road from the venue and there is a very cheap Travelodge 5 mins walk from the venue too. Click >>here<< for my Facebook page. Click >>here<< for my 'My Space' page to check out my latest gigs, radio shows & productions. Click >>here<< for the Digitized Recordings 'My Space' page.